BMZ Received Certificate for Gondola Car Serial Manufacturing Bryansk Engineering Plant has received a compliance certificate with A liter for serial manufacturing of 12-3090 model gondola cars with discharging gates from Federal Railway Transport Certification Register. For the first time, gondola car sample was demonstrated at International Railway Salon “Expo-1520” in autumn 2011, and it attracted the big interest from potential buyers. JSC Uralelectromed, Kazakhstan Railway and Uchalinsk Mining and Processing Plant have become the first clients of the cars. Nowadays, the largest consumer is JSC Kuzbassrazrezugol that has received about 2500 gondola cars by the end of the year. 12-3090 universal 4-axle gondola car with discharging gates has car body volume of 88 cubical meters, 69,5 tn. carrying capacity and 23,5 tn. axle load. Gondola car features reinforced structure of top cord, which prevents car body deformation during loading and unloading. Paneling of sidewalls reduces friction of cargo on the walls during unloading. 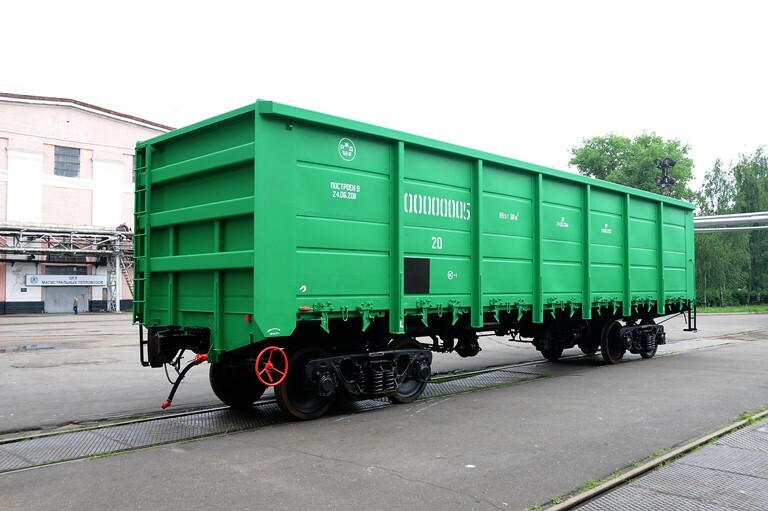 Gondola car is designed for transportation of goods that do not require weather protection: bulky, dusty, stacked, piece cargo, on 1520mm gauge in Russian Federation, CIS countries, Latvia, Lithuania, Estonia and Georgia. 12 state-of-the-art automated lines and benches purchased and installed during gondola cars industrialization, as well as a required number of produced jigs have contributed to high quality of products.